The Journal of Veterinary Medical Research (JVMR) is an international, open access and peer-reviewed journal. It aspires to publish high quality original research articles, review articles, short communication and case reports, which focus on at least one of the topics of veterinary sciences, and not have been published or considered for publication elsewhere. 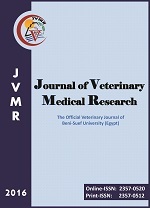 The JVMR is the official Veterinary Journal of Beni-Suef University, Egypt. It was launched in 1990 under the name of Beni-Suef Veterinary Medical Journal (BSVMJ) in a print form only, and then it was recently changed to Journal of Veterinary Medical Research (JVMR) in 2016 to publish two issues per year in both electronic and print forms.